Discover What Exactly Is Wheat Belly Diet, Learn What To Eat, Get Healthier And Feel Better Than Ever! Wheat is one of the most modified grains used in food processing today. What was once a relatively healthy grain is now causing health problems for many consumers. Cutting wheat from your daily diet will help you lose weight and gain energy, along with alleviating symptoms you may not have known were linked to your diet. 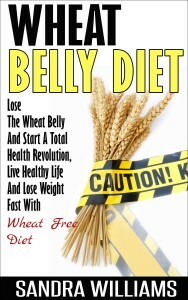 The Wheat Belly Diet was developed by a physician, and is a sound plan to lower your blood sugar. Giving up processed foods and fast food can be difficult at first, since they are such a part of everyday life for most people. However you may discover health benefits that surprise you when you stick with the wheat free diet. Effects On Skin, Blood Sugar, Joints And Other Healthy Benefits! Take action today and download this book for a limited time discount and pay only $2.99 $9.99! Eat healthy and feel better now! Sandra Williams is an author and publisher of books on healthy living, beauty advices and motivation techniques. She shares her ideas on how to get fit and what worked for her in a journey to healthier life. Interested in self-development, she explores all available tools to improve the quality of different areas of her life. Unlike in other personal development guides, her content describes her personal experiences and thoughts. She focuses on taking action. She always prefers quick and easy solutions that can be immediately implemented.